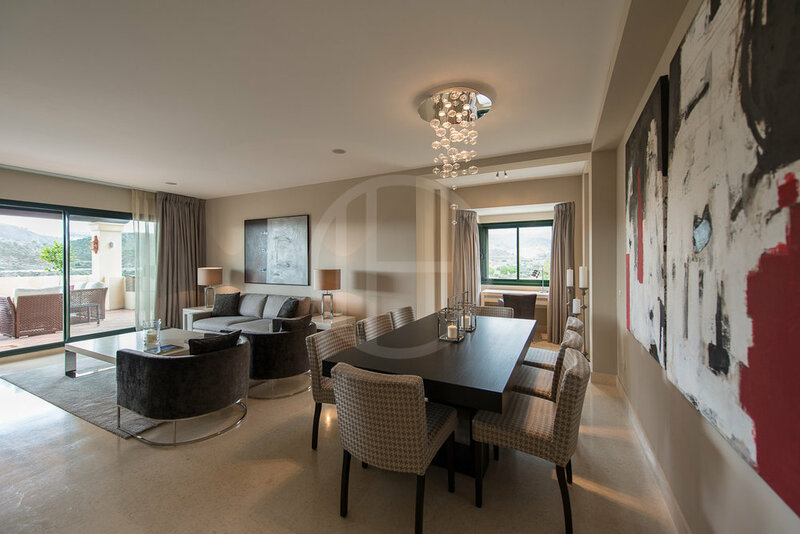 This frontline golf and beautifully decorated luxury penthouse apartment presents itself in impeccable condition. 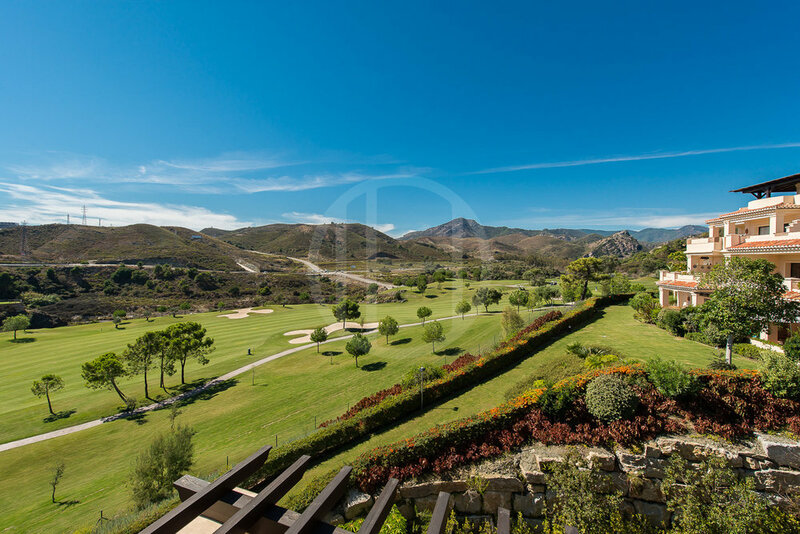 Situated in one of the most sunny and private buildings of this luxurious development with spectacular views of the mountain, sea and golf. The property is facing southwest and enjoys open golf and some sea views from its partly covered terraces. The interiors comprise on the entrance level of a hall, a large living room with dining and sitting area with fireplace, fully fitted kitchen with Bosch appliances and a separate laundry room, very large open and covered terraces, 2 bedrooms with en-suite bathrooms, a guest toilet, all delightfully decorated with designer furniture. On the upper floor, the lovely master suite has a large bedroom with high ceilings, a terrace with 2 lounge chairs, dressing area and a comfortable bathroom with shower and bath tub. The apartment is offered without the designer furniture but can be negotiated including an Audi Cabriolet in a total package if of interest. After the recent price reduction from € 795.000, this apartment is by far the best duplex penthouse offered on the marked in relation to condition, style, privacy and views. The urbanisation enjoys more than 50.000 m2 of carefully landscaped Mediterranean gardens, private social club, gym, Spa, swimming pool, fountains, waterfalls. There is a 24h surveillance system with a guard at the entrance gate. 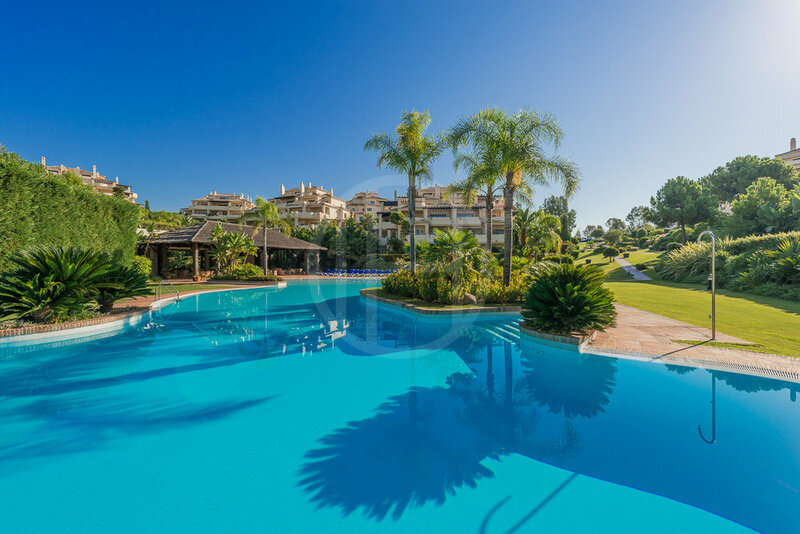 It is surrounded by the El Higueral golf course and at a short distance with car from the beach and supermarkets, local Sunday market and picturesque mountainside town of Benahavis, especially famous for its gastronomic variety and that its the wealthiest municipality in Spain. Puerto Banus, several tennis clubs and other top golf courses are all in a distance of 5-10 minutes by car.